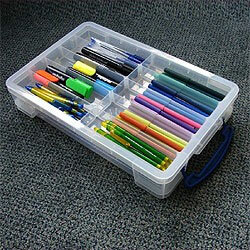 The organisational slots have been designed for normal pen lengths, and are 167 x 37 x 30 (mm). Please note: Pen tray only, box is available separately. - One lipped tray sits on the rim of a 7 litre Really Useful Box, leaving storage space beneath and to the side of the tray. - One lipped tray sits on the rim of a 9 litre Really Useful Storage Box, leaving storage space beneath the tray or room for up to three of the 4 litre unlipped hobby trays. - Two lipped tray sits on the rim of a 22 litre Really Useful Storage Box, leaving storage space beneath the tray or room for up to six of the 4 litre unlipped hobby trays.